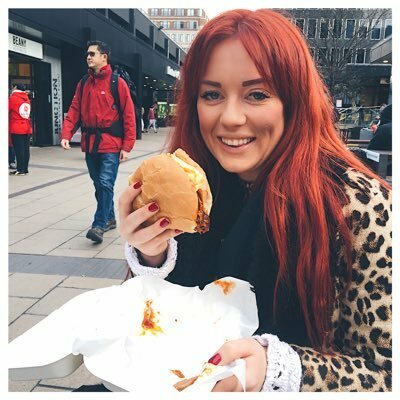 I love cooking - hence why I've got a food blog - but sometimes coming home from work and having to start cooking dinner just feels like a chore. There's always the option of ringing the local Chinese or Indian, but take-aways always tend to be unkind on the waist-line so what you need is a tasty, nutritious, home-cooked meal delivered to your door. Well I think I've found a pretty decent solution in Cookoo. The team recently got in touch to tell me a little about their service and arranged for me to try it out for myself. I'm sure a lot of people are familiar with the concept behind Cookoo. They have a team of chefs who put together a menu which you can chose from and order online, they then cook it up for you and deliver it straight to your door. All the food is nutritious, with the full break-down of macros and ingredients listed on the website, which is great if you track what you're eating. For my meal, I decided to try out some Vietnamese dishes from food writer and chef Uyen Luu. She runs a fabulous supper club in East London where she brings to life all the flavours from her home, Saigon. I ordered a portion of the Cà Ri Gà (£10), a traditional vietnamese curry made using chicken thighs, potatoes and carrots in a mild, fragrant sauce. 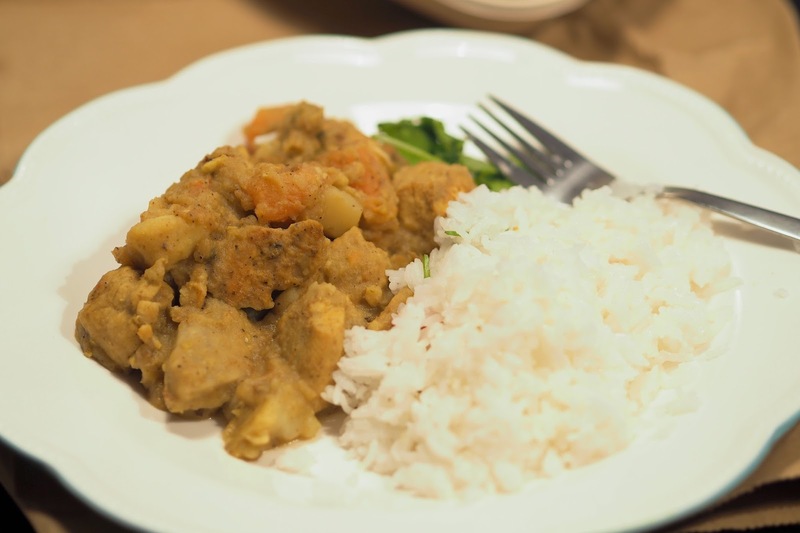 This came served with white rice, all of which arrived in cardboard containers which could be warmed up in less 5 minutes and were ready to serve. My curry had leaked a little on its journey to my house but as I'm outside of their normal delivery zone, it had to come via courier who I think was probably a little heavier handed than their normal delivery method! Flavour-wise the curry was beautiful, really light and delicate and felt way more nutritious than the normal curries which you get delivered from the take-away! I also ordered a jumbo prawn summer roll (£3.95) which was actually my favourite part! 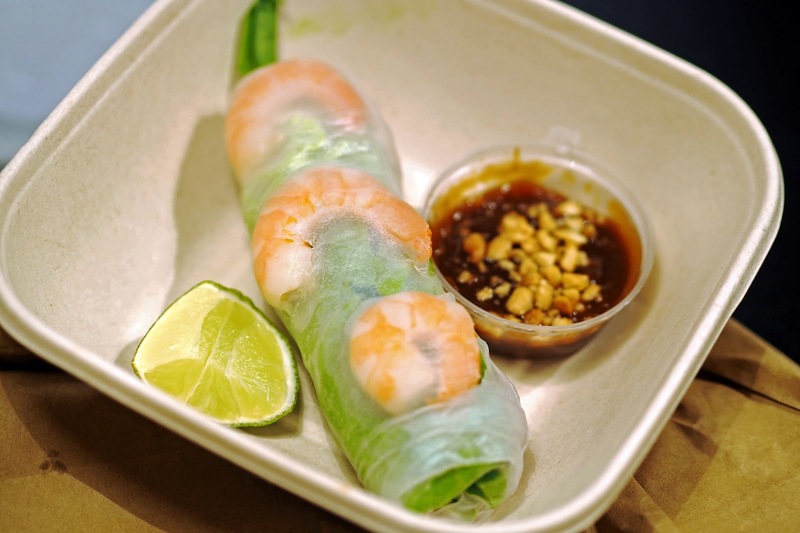 Loads of fresh ingredients including king prawns, vermicelli noodles, lettuce, mint and coriander wrapped up in rice paper and served with a delicious hoisin and sriracha dip. I was really impressed with the selection of food on offer and also the quality of the meal that arrived. It's probably a little too pricey to have all the time, but I think if I were to be having friends round and wanted to impress then I'd definitely order from Cookoo again. It's a great way of taking the stress out of dinner party entertaining - or a guilt-free alternative to a takeaway and DVD night! They currently only deliver to EC, WC, W1, N1 and SE1 postcodes but there are plans to expand so do keep your eyes peeled. 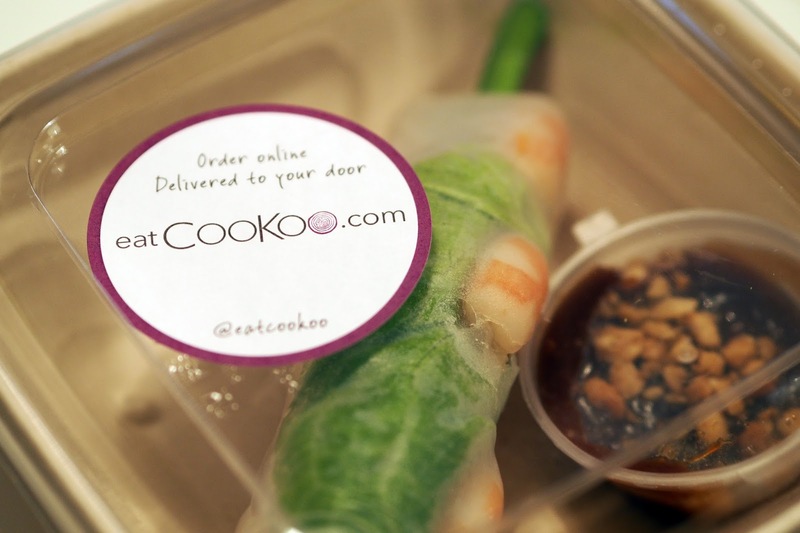 If you live or work in those postcodes and you'd like to try Cookoo for yourself, I've got a 20% off code (Cookoo20) which you can use at check-out! Let me know your thoughts if you do try it out!